This page includes the lighthouses of the two Italian regioni of Friuli-Venezia Giulia and Veneto, which together encircle the northwestern end of the Adriatic Sea. This area includes the important ports of Trieste and Venezia (Venice). The history of the area is lengthy and complex, but a few recent dates are important for understanding lighthouse history. The Republic of Venice, which had controlled much of the Adriatic for centuries, fell to Napoleon in 1796. At the end of the Napoleonic Wars in 1814 Friuli-Venezia Giulia continued as part of the Austrian Empire, while Veneto (Venetia) was placed under Austrian rule as part of the Kingdom of Lombardy-Venetia. Lombardy-Venetia was incorporated into Italy following the brief Third Italian War of Independence in 1866. Trieste continued under Austrian control until the Austrian Empire was dissolved following World War I; it was annexed to Italy in 1920. After World War II the city of Trieste and the adjoining peninsula of Istria became the Free Territory of Trieste under United Nations supervision. In 1954 the free territory was dissolved and the city of Trieste was returned to Italian sovereignty; Istria was incorporated into Yugoslavia and is now part of Slovenia. The Italian word for a lighthouse is faro, plural fari. This name is usually reserved for the larger coastal lights; smaller beacons are called fanali. 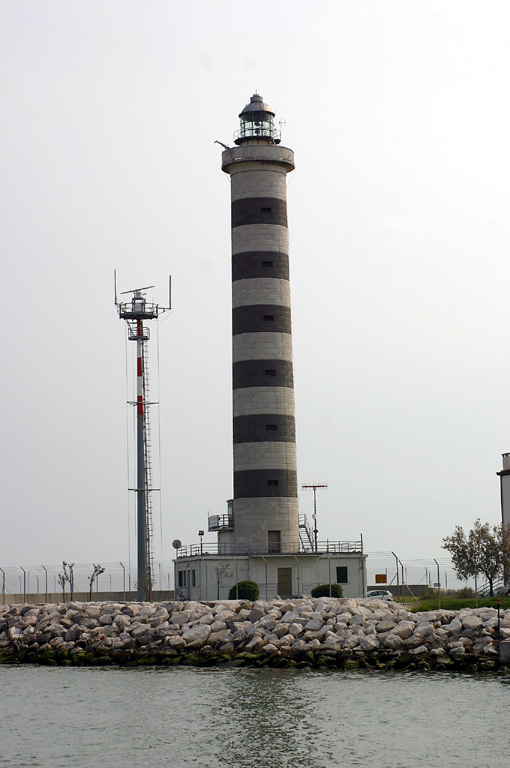 Aids to navigation are operated and maintained by the Italian Navy's Servizio dei Fari e del Segnalamento Marittimo. Lighthouse properties are naval reservations, generally fenced and closed to the public. ARLHS numbers are from the ARLHS World List of Lights. EF numbers are from the Italian Navy's light list, Elenco Fari. Admiralty numbers are from volume E of the Admiralty List of Lights & Fog Signals. U.S. NGA List numbers are from Publication 113. Photos posted by Anna Jenšíková. Navigation chart information for northeastern Italy. Date unknown. Daybeacon, never lit. Approx. 18 m (59 ft) square white stone obelisk with a pyramidal top. Simone Castellaneta has a photo, the Italian Wikipedia has a photo, and Google has a street view and a satellite view. This historic tower is a rare surviving example of a dromo, a form of daybeacon formerly common in Italy. This was the front tower of a day range, but the rear tower was destroyed during World War II. Located on Punta Sottile, the point at the southern entrance to the bay of Trieste, about 3 km (2 mi) west of San Rocco and 1.5 km (1 mi) north of the Slovenian border. Accessible by road. Site open. 1833 (station established 1769). Inactive since 1969. 31 m (102 ft) round stone tower with lantern and gallery, rising from a circular 2-story stone building. 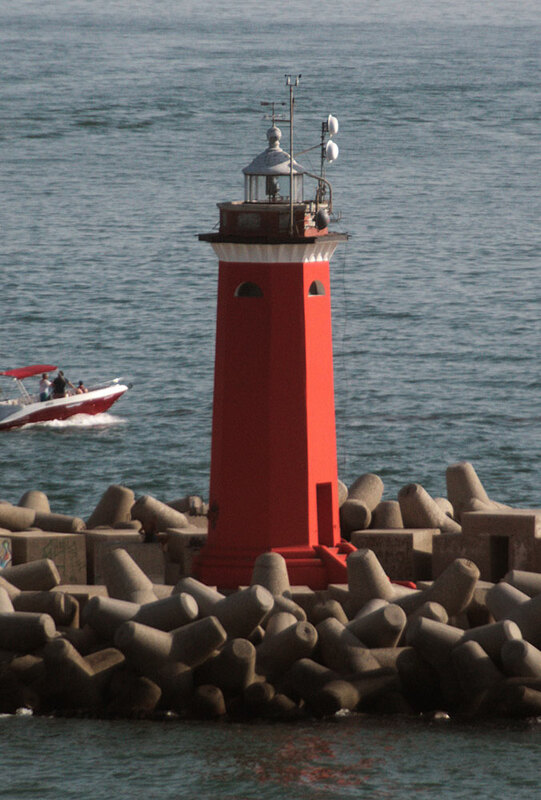 The lighthouse is unpainted white stone. A photo appears at right, John Sargent has a good photo, a 2014 photo is available, Marinas.com has aerial photos, and Google has a street view and a satellite view. This is the only surviving Austrian lighthouse in Italy. Built of Austrian limestone, it was designed by the architect Matteo (Matthäus) Pertsch and is considered to be an important part of Trieste's cultural heritage. It replaced a lighthouse ordered by the Empress Maria Theresa that took 25 years to build (1744-1769). Much earlier there was a Roman lighthouse in Trieste (then called Tergestum), and as early as the 7th century lights were shown from the tower of the chapel of San Nicolò. Located on the Molo Fratelli Bandiera, the main pier in the heart of the Trieste waterfront. Site open, tower closed. Date unknown (station established 1863). Replaced. This was a 4 m (13 ft) square masonry tower with gallery but no lantern, painted red. Lightphotos.net has a photo by A.J. de Graaf, Francesca Palazzi has a distant view, and Google has a satellite view. Trabas has a photo showing that the light has been replaced by a standard bottle-style pierhead light (focal plane 7 m (23 ft); red flash every 3 s). 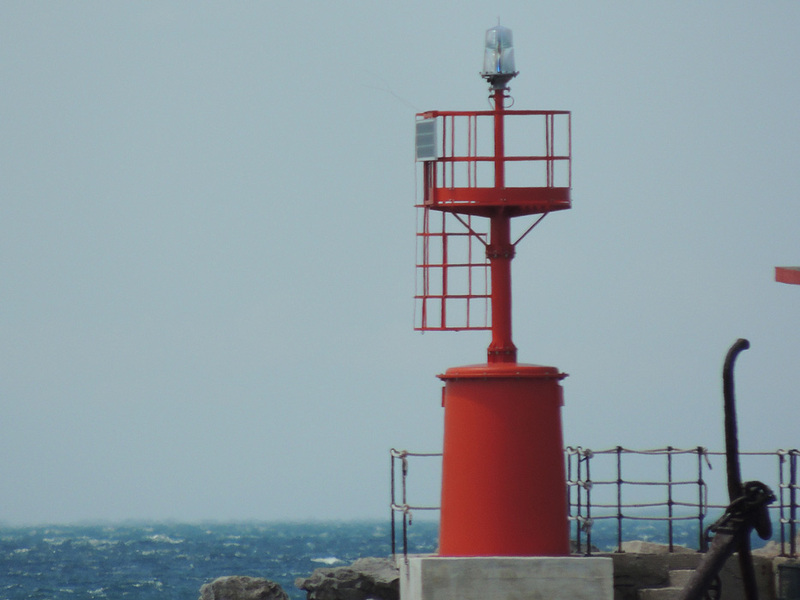 Located at the south end of the detached breakwater protecting the harbor of Trieste. Accessible only by boat. Site and tower closed. Active light: EF-4402; Admiralty E2560; NGA 11680. Date unknown. Replaced. This was a 5 m (17 ft) square masonry tower, painted green. Trabas has a photo of the original light and Google has a satellite view of the new one (focal plane 7 m (23 ft); continuous green light), which is on a post. 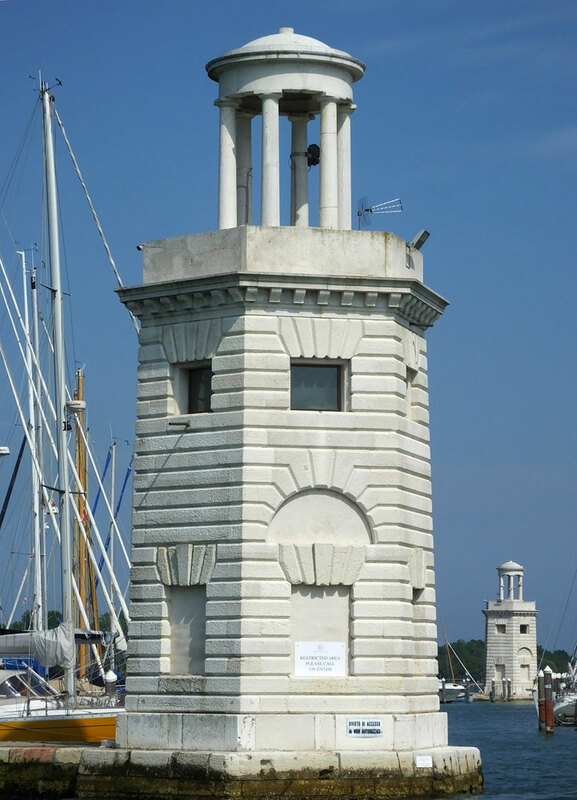 Located on a short spur near the north end of the detached breakwater protecting the harbor of Trieste. Accessible only by boat. Site and tower closed. Active light: EF-4396; Admiralty E2561; NGA 11684. 1927. Active; focal plane 115 m (377 ft); two white flashes every 10 s. 68 m (223 ft) round fluted stone tower with lantern and gallery, crowned by a bronze statue of Victoria (winged victory). A photo is at right, Dario Manzoni has a good closeup photo, Trabas has a photo, another photo is available, Italian Wikipedia has a page for the lighthouse, Wikimedia has several good photos, Luca Deboli's view from downtown Trieste gives a sense of the setting, Marinas.com has aerial photos, and Google has a satellite view and a street view. 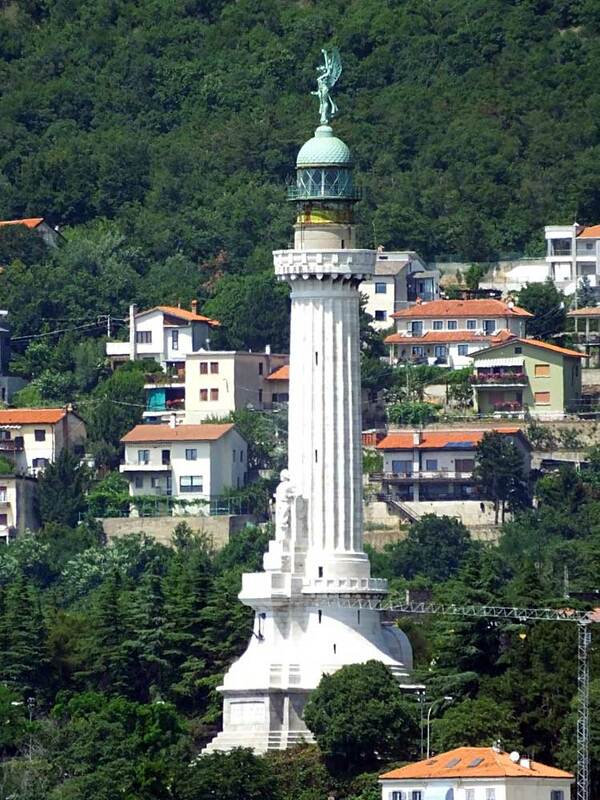 This lighthouse was built after World War I brought Trieste and the Istrian peninsula to the south under Italian control. Built of Istrian stone on the foundation of a 19th century Austrian fortress, the lighthouse was designed by the architect Arduino Berlam with sculptures by Giovanni Mayer. The structure celebrates the Italian victory and is a memorial to Italian sailors lost in the war. It stands on the hill of Gretta, off the Strada del Friuli, about 2 km (1.2 mi) north of the central city and waterfront. This is one of the few Italian lighthouses regularly open to the public. Site open, lighthouse open daily except Wednesdays from April 1 through September 30 and on Sundays and major feast days during the rest of the year. Site manager: Provincia di Trieste. ARLHS ITA-174; EF-4376; Admiralty E2558; NGA 11676. Date unknown. 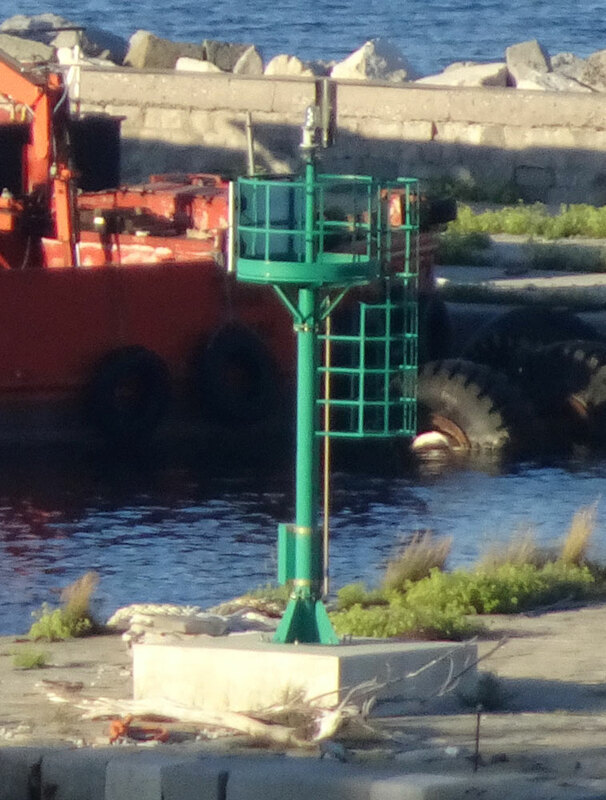 Active; focal plane 7 m (23 ft); red flash every 5 s. 7 m (23 ft) round concrete tower mounted on a round concrete pier. Lighthouse painted red. Trabas has a photo, and Bing has a satellite view. Located on a shoal off the mouth of the Isonzo (Soča) River at the extreme northern end of the Adriatic Sea. Accessible only by boat. Site open, tower closed. Admiralty E2540; NGA 11634. 1902. Inactive. 6 m (20 ft) square wood tower with a pyramidal roof, mounted on a square concrete pier; the light was shown from the peak of the roof. Formerly painted red, now painted with red and white horizontal bands. Roger McLassus contributed a photo to Wikimedia, Giandomenico Ricci has a good 2007 photo, and Google has a street view and a satellite view. Located in the surf at the eastern end of Porto Lignano Sabbiadoro, where it marked the western entrance to the Laguna di Marano. Site open, tower closed. Date unknown (station established 1902). Active (privately maintained? ); focal plane 7 m (23 ft); red flash every 2 s. 6 m (20 ft) square wood tower with a pyramidal roof, mounted on a square concrete pier; the light is shown from the peak of the roof. Lighthouse painted red. Trabas has a closeup photo, Luigi Chiesa contributed a photo to Wikipedia that shows both lighthouses, Giandomenico Ricci has a good 2007 photo, and Google has a street view and a satellite view. This exact copy of the 1902 lighthouse was built when a new pier was constructed adjacent to the old light. The light is not on the Navy light list. Located at the end of the pier at the eastern end of Porto Lignano Sabbiadoro, where it marks the western entrance to the Laguna di Marano. Accessible by walking the pier. Site open, tower closed. Admiralty E2521; NGA 11576. Date unknown. Active (privately maintained? ); focal plane about 9 m (30 ft); light characteristic unknown. Mast mounted atop a pierhead bar and café. Trabas has a closeup photo, Toni Bornacin has a closeup street view, and Google has a satellite view. The first light at Lignano was established in 1902. 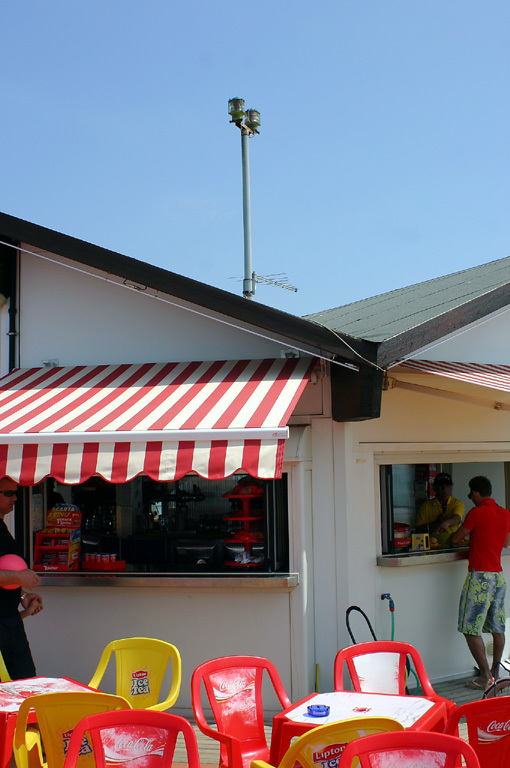 Located on the pier at Lignano Pineta, a beach resort area of Lignano Sabbiadoro. Site open, tower closed. Site manager: La Pagoda. Admiralty E2519. 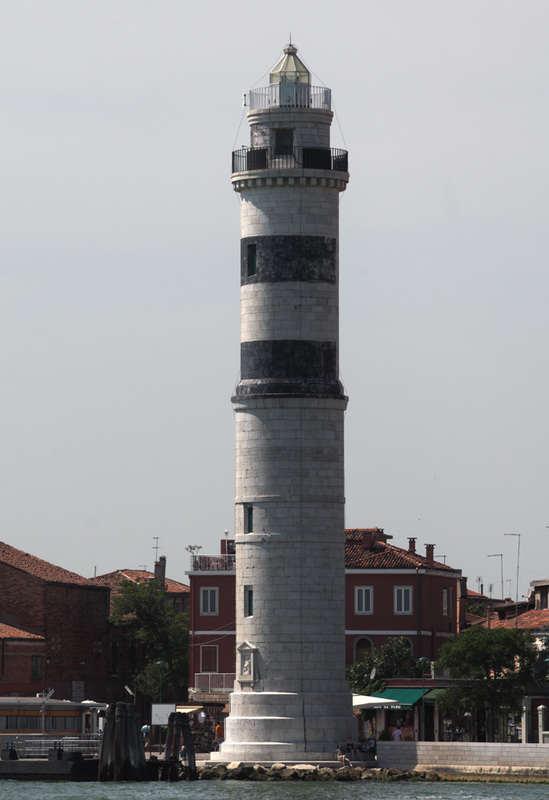 Note: Except for the two lighthouses of Rovigo Province, all the following lighthouses of Veneto are located in Venezia (Venice) Province. Located just to the north of the Po Delta, the Laguna Veneta (Venice Lagoon) is separated from the Adriatic Sea by barrier islands. There are three navigable gaps in the barrier: the Porto di Lido in the north, closest to the city, the Porto di Malamocco in the center, and the Porto di Chioggia on the south. The barrier island between the Porto di Lido and the Porto di Malamocco is known as the Lido di Jesolo or the Lido di Venezia. 1913. Active; focal plane 22 m (72 ft); three white flashes every 10 s. 21 m (69 ft) round concrete tower with lantern and gallery, attached to the landward side of a 2-story keeper's house. Entire lighthouse is white concrete; lantern dome is gray metallic. A photo is at right, Giorgio Rafaelli has an excellent photo, Trabas has a closeup by Capt. Peter Mosselberger, Marinas.com has aerial photos, and Google has a beach view and a satellite view. The light station is on the beach, clearly endangered by storm surges or rising sea level. Several stone seawalls have been built in the surf to protect it. 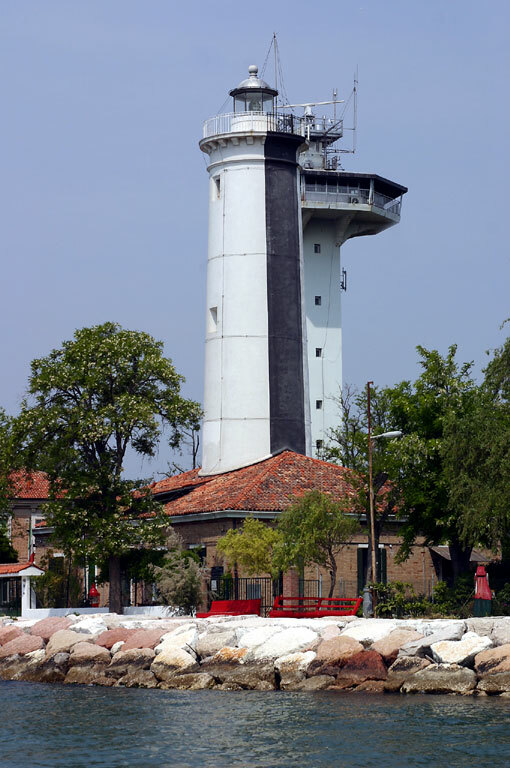 This lighthouse overlooks the former Austrian frontier, so from 1866 to 1918 it marked the easternmost point of Italy. Located on a promontory at the end of Via del Faro on the east side of Bibione. Site open, tower closed. ARLHS ITA-148; EF-4288; Admiralty E2518; NGA 11572. 1917. Active; focal plane 12.5 m (41 ft); two white flashes every 6 s. Approx. 20 m (66 ft) square church tower with an octagonal steeple. The light is mounted on a bracket about halfway up the tower. Tower painted white. Trabas has a good photo, Dennis Schulze has a 2018 photo, Huelse has a historic postcard view, and Google has a street view and a satellite view. The tower is not attached to the church, the Chiesa della Madonna dell'Angelo. Endangered by erosion, the church and lighthouse are protected by a curved seawall. Located on a promontory at the eastern end of the waterfront of Caorle. Site open, tower closed. EF-4272; Admiralty E2508; NGA 11568. 1950 (station established 1853). 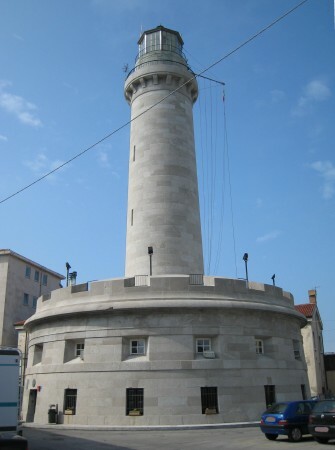 Active; focal plane 45 m (148 ft); four white flashes every 20 s. 48 m (157 ft) round cylindrical stone tower with lantern and gallery, attached to a 3-story harbor control building. Lighthouse painted with gray and white horizontal bands. The lighthouse is floodlit at night. This is an active Coast Guard station. Michael Kesler's photo is at the top of this page, Trabas has a photo, Huelse has a postcard view, Marinas.com has aerial photos, and Google has a street view and a good satellite view. 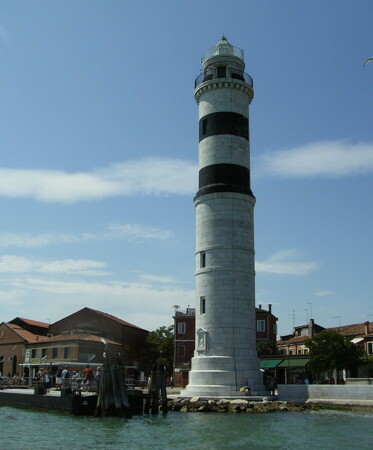 The building at the base of the lighthouse is the harbor master's office for Venice. The original lighthouse was destroyed by German troops during World War II. Located on the west side of the Sile River entrance, about 11 km (7 mi) east of the Porto di Lido. Site open, tower closed. ARLHS ITA-119; EF-4264; Admiralty E2504; NGA 11556. 1908 (station established 1898 with a buoy off the end of the mole). 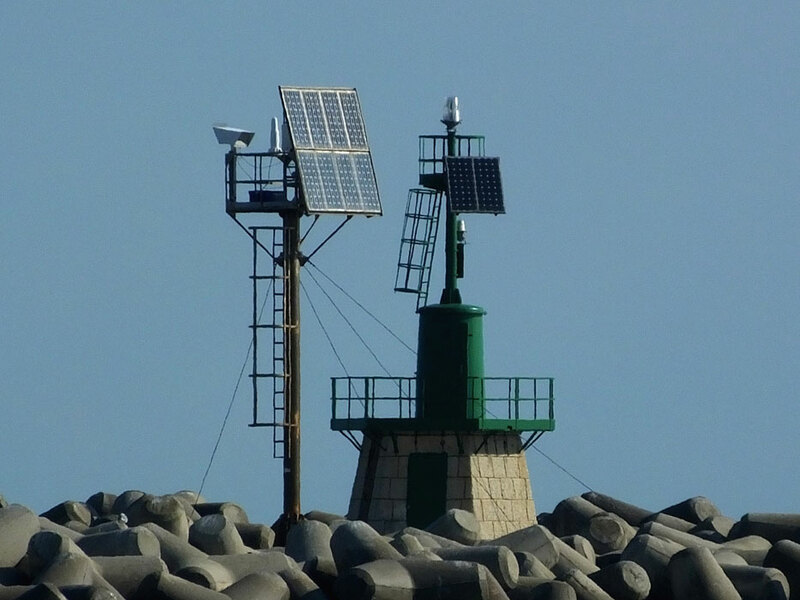 Active; focal plane 26 m (85 ft); two long (2 s) white flashes every 12 s; also an entrance light, two green flashes every 8 s, at a focal plane of 14 m (46 ft), corresponding to the south mole light. 25 m (82 ft) square cylindrical skeletal tower with lantern and gallery mounted atop a 4-story building. The seaward front of the building is painted in a black and white checkerboard pattern; the lantern is white; and the skeletal tower and lantern roof are gray metallic. Trabas has a photo, Vaclav Uhlir has a closeup photo, Wikimedia has a photo, Bálint Puskás has a photo sphere, and Google has a satellite view. This lighthouse is always called the Pagoda, although its resemblance to a pagoda seems rather obscure. Jenšíková has a photo taken from the landward side in which the profile of the building is vaguely pagoda-like. 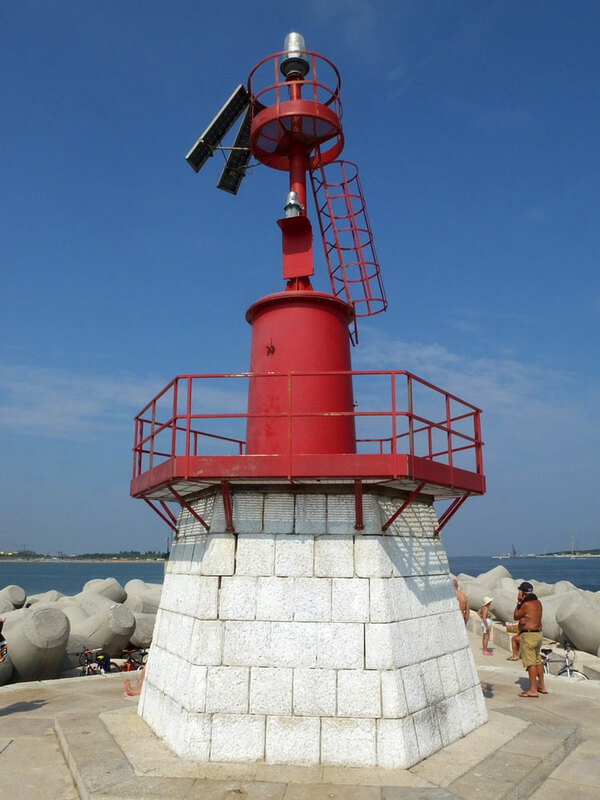 Located at the end of the north mole at the Porto di Lido; this mole is only about 400 m (1/4 mi) long. Site and tower closed, but there's a good view from the base of the mole in Punta Sabbioni. EF-4152; Admiralty E2480; NGA 11516. 1908 (station established 1898 with a buoy off the end of the mole). Active; focal plane 14 m (46 ft); two red flashes every 8 s. 14 m (46 ft) octagonal brick tower with lantern and gallery. The lighthouse is unpainted red brick with white stone trim under the gallery; lantern roof is white. Trabas has a photo, Jenšíková has a distant photo (lower photo on the page), a closeup photo is available, and Google has a street view and a satellite view. Located at the end of the south mole at the Porto di Lido; this mole is about 2.5 km (1.5 mi) long. Accessible only by boat. Site and tower closed. ARLHS ITA-239; EF-4164; Admiralty E2484; NGA 11520. Date unknown. Active; focal plane 13 m (43 ft); white flash every 3 s; also a passing light, green flash every 4 s, at a focal plane of 3 m (10 ft). 10 m (33 ft) square skeletal tower wrapped in some material colored with black and white horizontal bands, mounted on a wood platform on wood piles. Trabas has a photo, Lightphotos.net has a good photo, Jenšíková also has a photo, and Google has a good satellite view. Located about 400 m (1/4 mi) north of the northern tip of Lido di Venezia. Accessible only by boat. Site open, tower closed. ARLHS ITA-259; EF-4177; Admiralty E2486; NGA 11524. 1912. Active; focal plane 37 m (121 ft); white light, 4 s on, 2 s off. 35 m (115 ft) round cylindrical stone tower with lantern and double gallery. 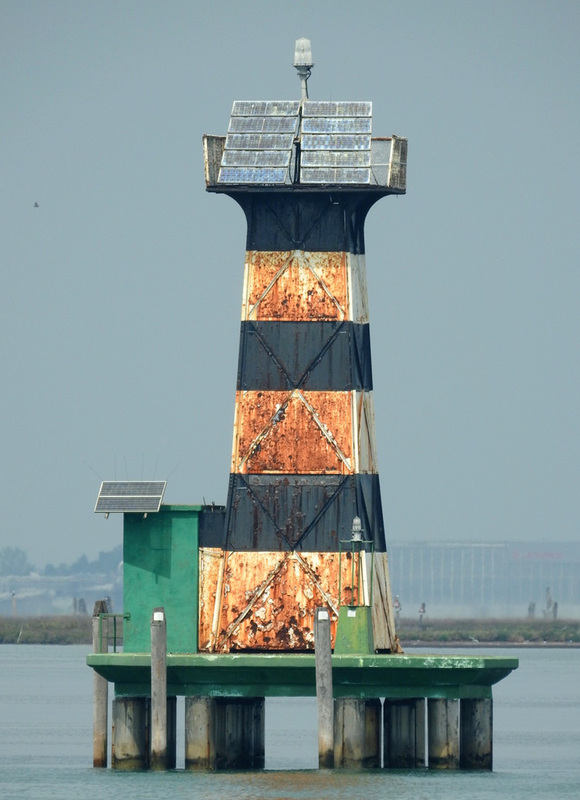 The lighthouse is painted white; near the top there are three black horizontal bars facing the range line. The lantern appears to be empty and without glass; the light is apparently mounted on the top gallery rail. A photo is at right, Trabas has a photo, another excellent photo is available, and Google has a street view and a satellite view. The lighthouse has a distinct lean in the seaward direction. Murano is part of the city of Venice but about 1.5 km (1 mi) to the north; it is accessible by waterbus from the central city. Located 3.2 km (2 mi) west northwest of the front light, on the southeast side of the Isola di Murano, near the foot of the Calle Giuseppe Briati. Site open, tower closed. ARLHS ITA-088; EF-4177.1; Admiralty E2486.1; NGA 11528. Date unknown. Active; focal plane 7 m (23 ft); two red flashes every 10 s. 7 m (23 ft) post centered on a hexagonal equipment shelter. Equipment shelter painted red. Trabas has a closeup photo, Lightphotos.net has a photo, and Google has a water view and a satellite view. The Canale di San Marco is the main channel leading to the center of Venice. Located on the south side of the channel east of the small island of San Servolo. Accessible only by boat. Site open, tower closed. EF-4236; Admiralty E2492; NGA 11548. Date unknown. Active (privately maintained); focal plane about 10 m (33 ft); light pattern unknown. Approx. 12 m (39 ft) octagonal stone tower with gallery. The lighthouse is unpainted white stone. Trabas has a photo, Huliganjetta Rivera has a 2018 photo, and Google has a water view and a satellite view. San Giorgio Maggiore is an island across the Grand Canal from the center of Venice. A breakwater protects a harbor on the north side of the island, and this is the western of two identical towers at the ends of the breakwater. The west tower is in the foreground of Camille King's photo of the island. It is not known if the east tower has been used as a lighthouse. 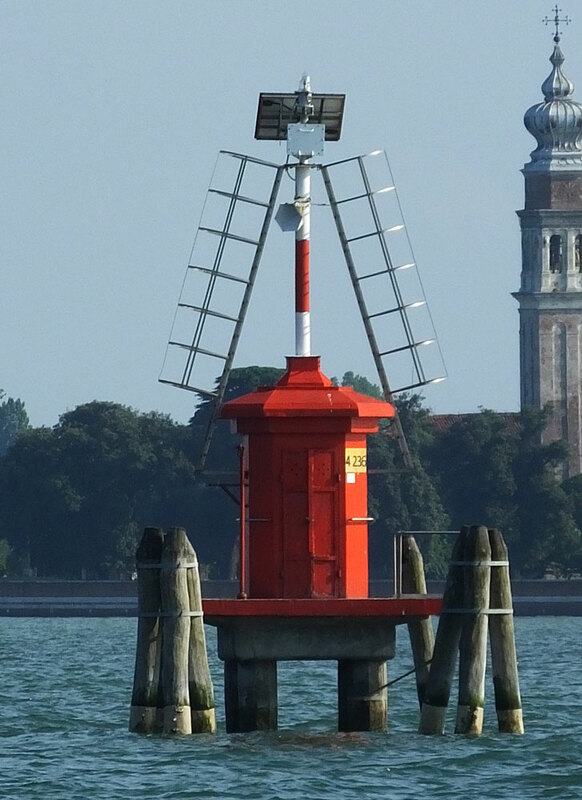 Located at the western end of the San Giorgio Maggiore breakwater. Accessible only by boat. Site open, tower closed. Admiralty E2498. Date unknown. Inactive. Approx. 20 m (66 ft) round masonry tower with gallery, rising from a 2-story keeper's house. Lantern removed. The lighthouse is unpainted. Egidio Ferrighi has a photo and Google has a street view and a satellite view. We need information on the history of this interesting abandoned lighthouse. 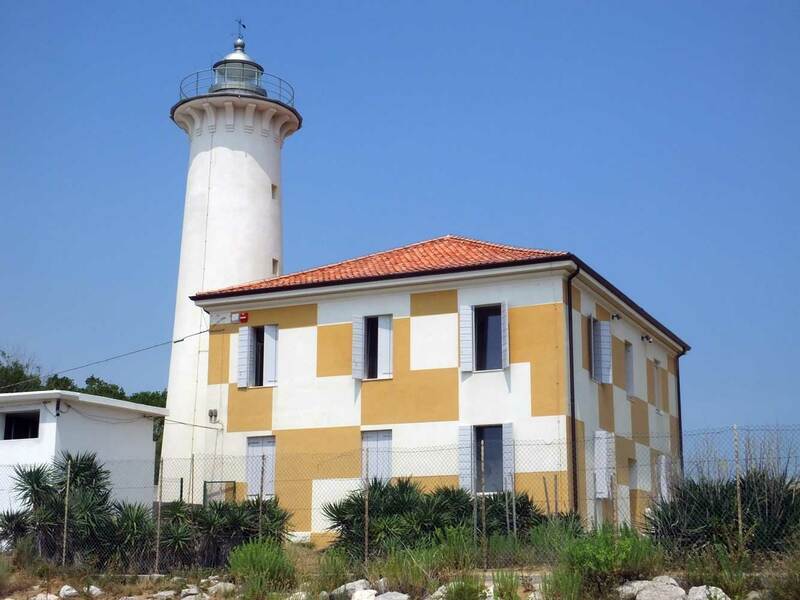 The Italian Wikimedia article on Spignon says that the Alberoni lighthouse was part of an older system predating the Spignon lighthouse; that would put the activity of the lighthouse in the 1840s and/or 1850s. Located on the Strada della Droma, on the heights of Alberoni, perhaps 800 m (1/2 mi) northeast of the Faro di Rocchetta. Site open, tower closed. Date unknown (station established 1874). Active; focal plane 18 m (59 ft); green flash every 5 s. 19 m (62 ft) square cylindrical light tower with lantern and gallery, mounted atop a 2-story keeper's house. 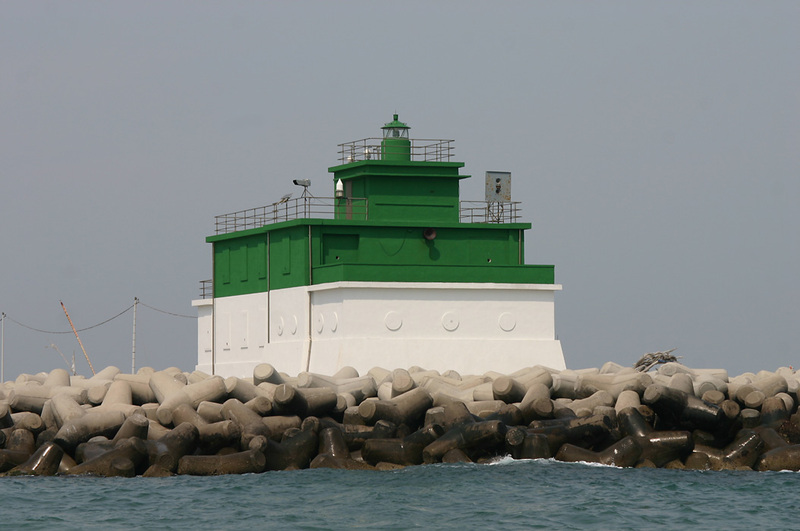 Upper half of the lighthouse painted green, lower half white. Trabas has a photo, Piergiorgio Ghezzo has a 2017 photo, Wikimedia has a photo, Raffael Greminger has a street view, and Google has a satellite view. The Porto di Malamocco is the central one of three entrances to the Laguna Veneta. The lighthouse was restored and repainted in 2007. 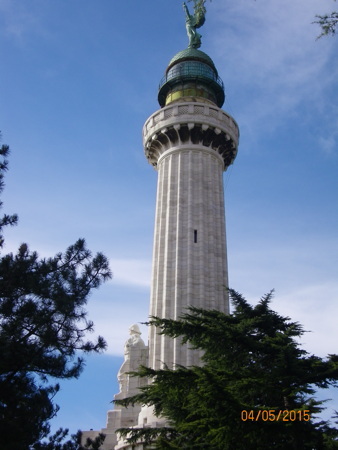 The original lighthouse was an octagonal tower with a focal plane of 12.5 m (41 ft). Located at the end of the north mole at Porto di Malamocco. Site and tower closed officially, but there seem to be many visitors. ARLHS ITA-220; EF-4138; Admiralty E2466; NGA 11500. 2007. 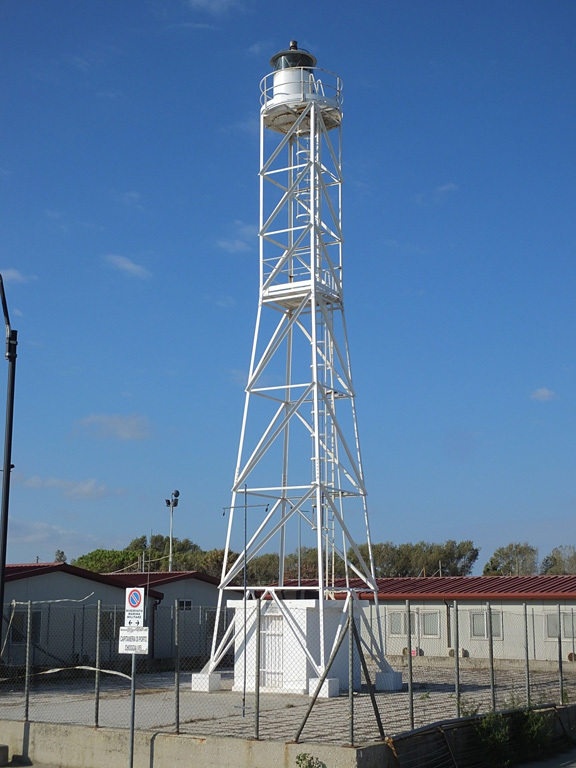 Active; focal plane 18 m (56 ft); red flash every 5 s. 16 m (52 ft) round cylindrical tower with lantern and gallery, painted red. Trabas also has a photo and Google has a satellite view. 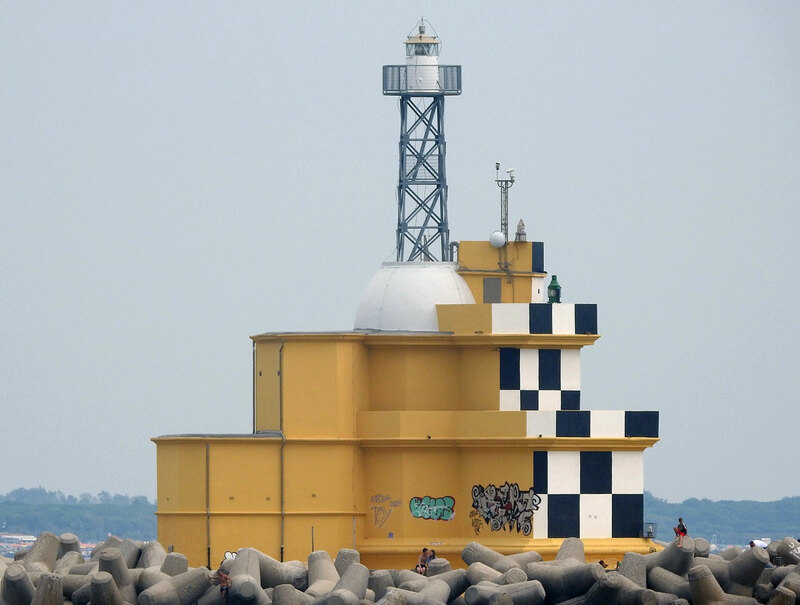 This new lighthouse was installed at the end of a long, curving breakwater (completed in 2007) that is part of major project to protect Venice from disastrous tidal flooding. The Magistrato alle Acque di Venezia has posted an aerial photo that shows the new breakwater and all three of the Malamocco lighthouses. Site and tower closed (this is not a walkable breakwater). EF-4141; Admiralty E2466.2. 2007 (station established 1860?). Active; focal plane 16 m (52 ft); red flash every 5 s. 14 m (46 ft) octagonal tower with lantern and gallery. Lighthouse painted red. Trabas has a photo and Google has a satellite view. Located at the end of the detached south breakwater at Porto di Malamocco. Accessible only by boat. Site and tower closed. ARLHS ITA-221; EF-4140; Admiralty E2467; NGA 11496. Date unknown (station established 1879). Active; focal plane 25 m (82 ft); three white flashes every 12 s. 24 m (79 ft) round cement-clad brick tower with lantern and gallery, rising through the center of a 1-story brick keeper's house. Lighthouse painted white with a black vertical stripe on the seaward side. Marc Ryckaert's photo is at right, Trabas has a good photo, Alberto Manzoni has a 2011 photo, Wikimedia has Marco Biagioli's closeup, Marinas.com has aerial photos, Italian Wikipedia has an article with a photo, and Google has a satellite view. 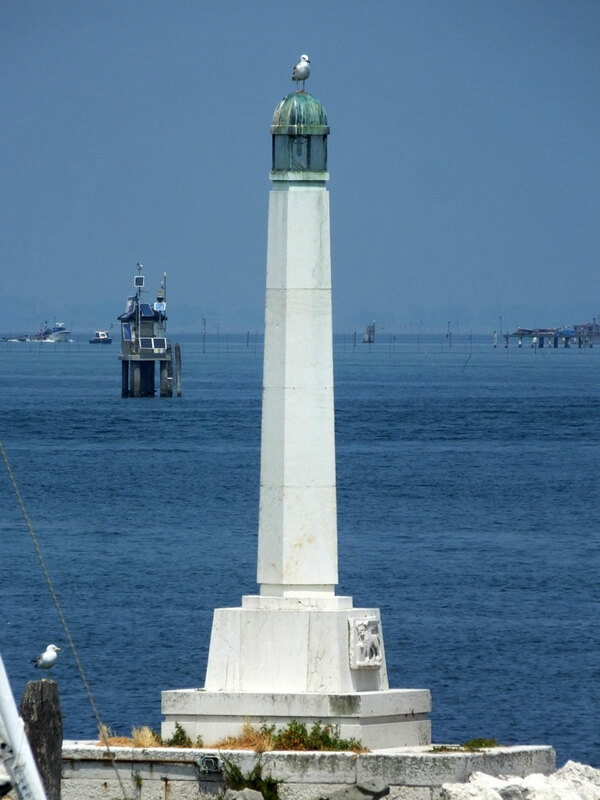 This lighthouse marks the south end of the Lido di Venezia, the barrier island that protects Venice from the Adriatic. The keeper's house is a staffed coast guard station. Built in 1855, the original lighthouse was not activated until 1879. Located on the north side of the Porto di Malamocco in Alberoni. Site open, tower closed. ARLHS ITA-180; EF-4132; Admiralty E2464; NGA 11488. Date unknown. Active; focal plane 30 m (98 ft); continuous white, red or green light, depending on direction. 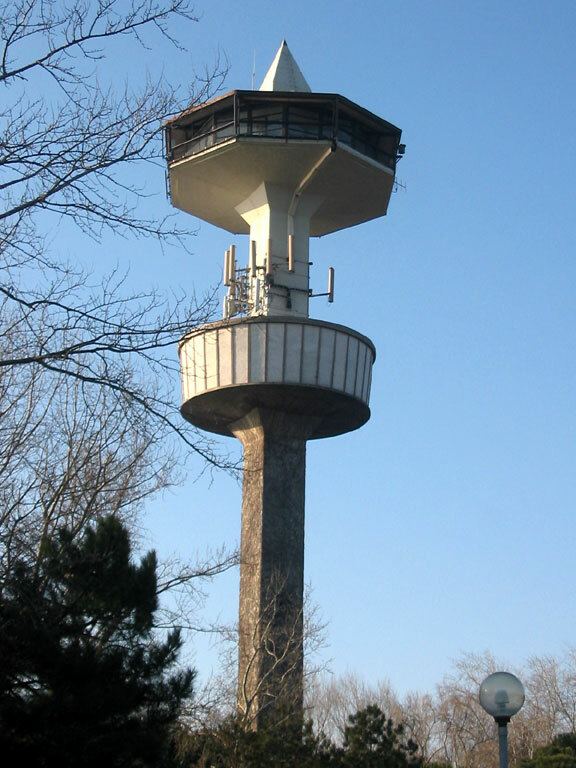 35 m (115 ft) square cylindrical tower supporting a large octagonal control room and a square platform with a radar antenna. Entire building is gray. Trabas has a photo and Google has a satellite view and a distant street view (note the Rocchetta lighthouse in the background). The old 2-story pilot building is at the base of the new tower. The lights guide vessels in the entrance channel at Malamocco. 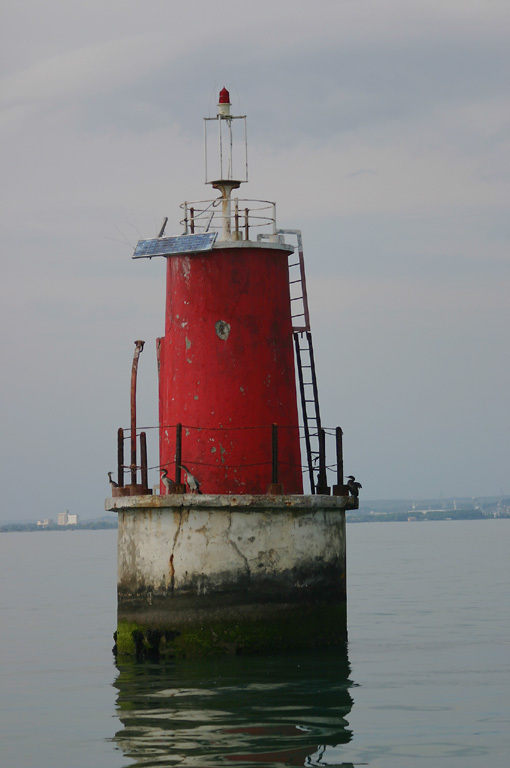 Located about 70 m (75 yd) northwest of the Rochetta lighthouse. Site open, tower closed. Admiralty E2463; NGA 11490. 1886 (station established 1860). Inactive for many years. 15 m (49 ft) round brick tower with gallery. Lantern removed. The lighthouse is unpainted. Several small ruined wooden buildings are at the base of the tower. Valter Bolzonella has a photo, Stefano Roverato has a more distant view, and Google has a satellite view. This abandoned lighthouse guided ships between Venice and the Porto di Malamocco. Located on a sandbar in the Laguna Veneta, about 2.5 km (1.5 mi) west of the Porto di Malamocco. Accessible only by boat. Site and tower closed. Date unknown. Active; focal plane 11 m (36 ft); green flash every 3 s. 7 m (23 ft) bottle-style post, painted green, centered on a hexagonal unpainted concrete block equipment shelter. Trabas has Capt. Peter Mosselberger's photo, Lorenzo Bellemo has a photo, and Google has a satellite view. 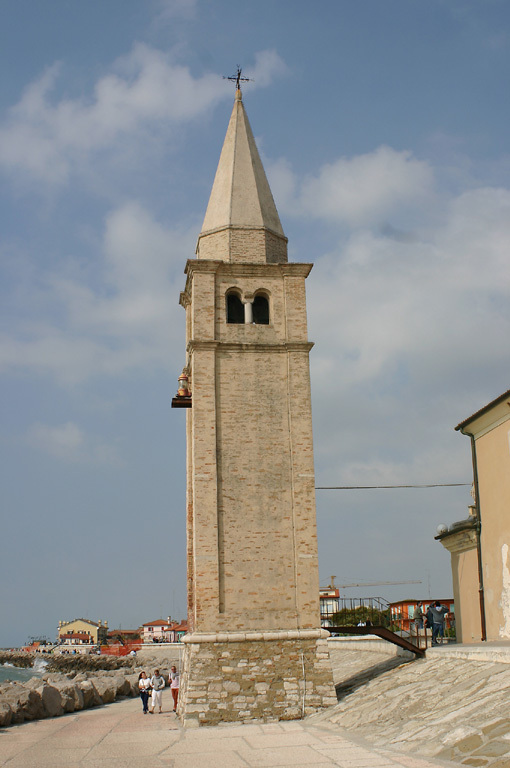 Chioggia is a port at the southernmost entrance to the Laguna Veneta. 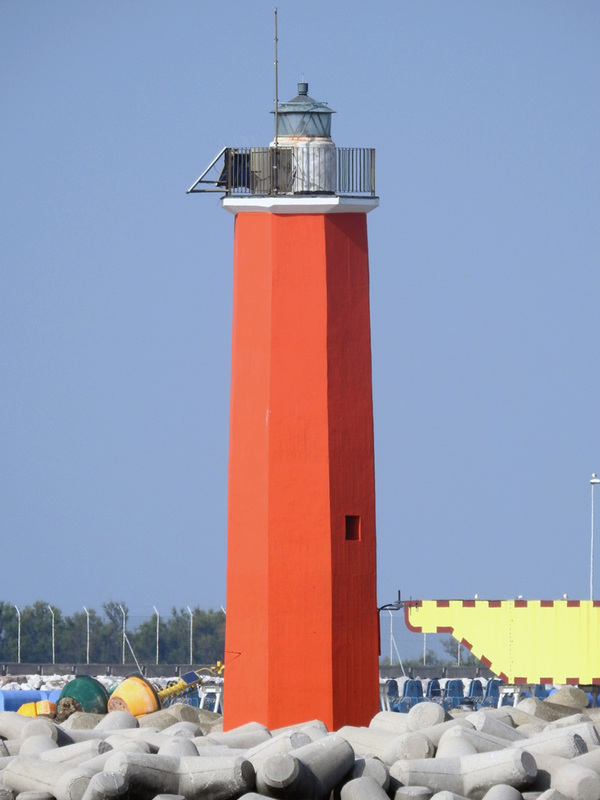 Located at the end of the north breakwater of Chioggia harbor. Site and tower closed. EF-4108; Admiralty E2452; NGA 11460. Date unknown. Active; focal plane 11 m (36 ft); two red flashes every 10 s. 8 m (26 ft) bottle-style post, painted red, centered on a hexagonal unpainted concrete block equipment shelter. Trabas has Capt. Peter Mosselberger's photo, Leonardo Tonello has a 2018 photo, another good photo is available, and Google has a street view and a satellite view. 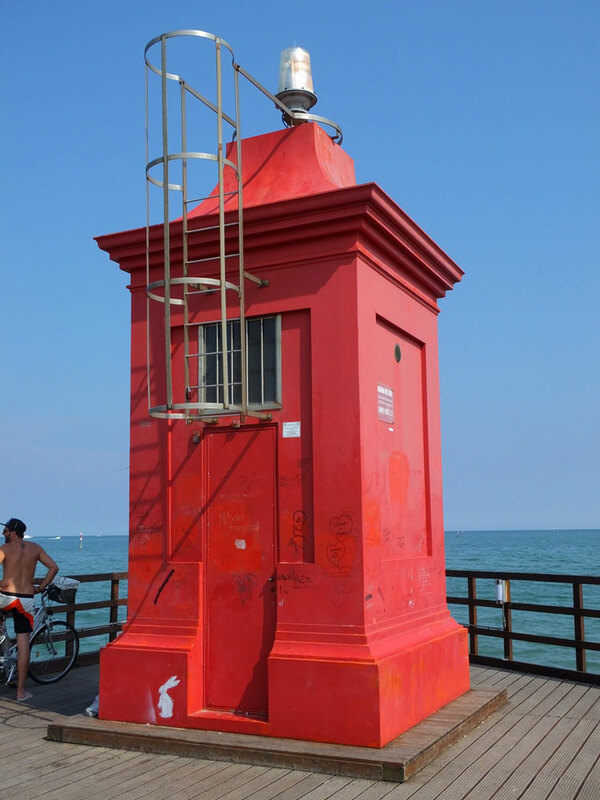 Located at the end of the south breakwater of Chioggia harbor. Accessible by walking the pier. Site open, tower closed. EF-4110; Admiralty E2453; NGA 11464. 1996 (station established 1868). Active; focal plane 20 m (66 ft); two long (2 s) white flashes every 10 s. 18 m (59 ft) square skeletal tower with lantern and gallery. Lighthouse painted white. Trabas has Capt. Peter Mosselberger's photo and Google has a street view and a satellite view. Located east of the Forte San Felice, an area accessible by road from Sottomarina, the beachfront community of Chioggia. Accessible by road; parking is available. Site open, tower closed. EF-4104; Admiralty E2450; NGA 11452. 1868. Inactive since 1996. Octagonal stone tower with lantern and gallery mounted on an 18th century fort. Tower is unpainted; lantern dome is gray metallic. Ferrighi has a distant view, Marinas.com has aerial photos, and Google has a satellite view. Built in the 18th century, the Forte San Felice guarded the entrance to Chioggia. The fort is in dilapidated condition and is not open to the public. 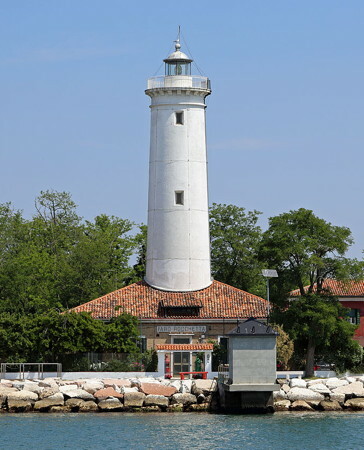 Located on the south side of the Porto di Chioggia entrance. Site and tower closed. ARLHS ITA-054. Date unknown. Active (privately maintained); green light, characteristic unknown. Approx. 9 m (30 ft) square concrete pillar with a small lantern. Trabas has Capt. Peter Mosselberger's photo, and Google has a satellite view and a very distant street view. Located on the main breakwater of the Le Saline docks, a small boat harbor southwest of the Forte San Felice. Site status unknown. Admiralty E2458.1. 1980s(?) (station established 1914). Active; focal plane 55 m (180 ft); white light, 2 s on, 4 s off. 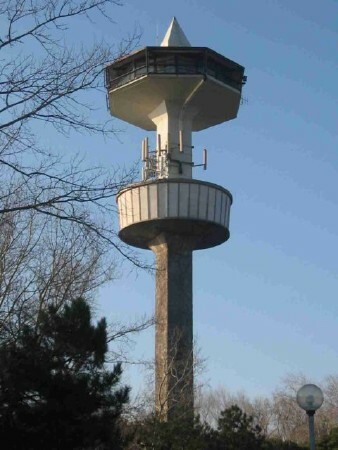 52 m (171 ft) water tower, square cylindrical with an octagonal tank structure at the top and a round one below. Ferrighi's photo at right is the same as the photo on the Navy's page, Trabas also has the same photo, and Google has a street view and a satellite view. The original light was on a skeletal tower. 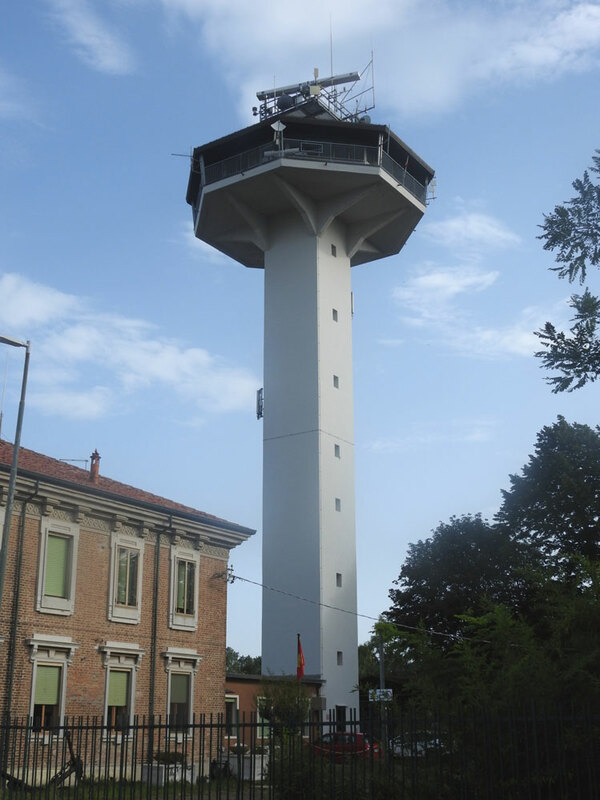 Unusually decorative for a water tower, the present light is located on the Viale Toni Gardin in Isola Albarella, a resort community on the north side of the Po di Levante, the northernmost mouth of the Po River. Site open, tower closed. EF-4101.45; Admiralty E2443; NGA 11448. 1949 (station established 1885). 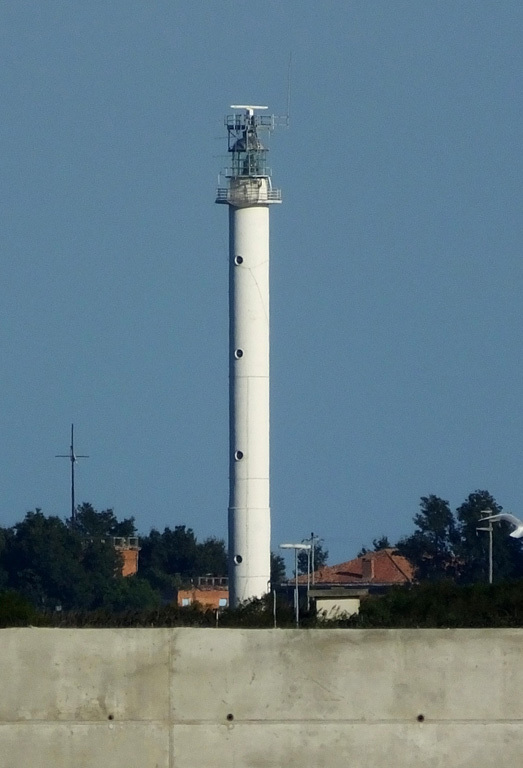 Active; focal plane 47 m (154 ft); three white flashes every 20 s. 45 m (148 ft) round cylindrical tower with lantern and gallery, painted white. Trabas has Capt. Peter Mosselberger's photo, Marinas.com has aerial photos, and Google has a satellite view of the station. 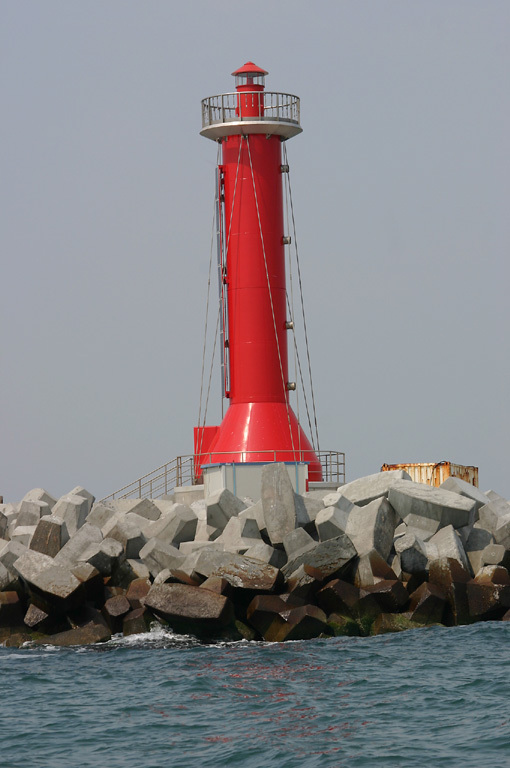 The original lighthouse, known as the Faro di Pila, was about 4 km (2.5 mi) west of the current light station. It was destroyed by German troops during World War II. The Po River has formed a large delta extending into the Adriatic; Punta della Maestra is the tip of the delta and the location of the river's largest mouth, the Po della Pila. 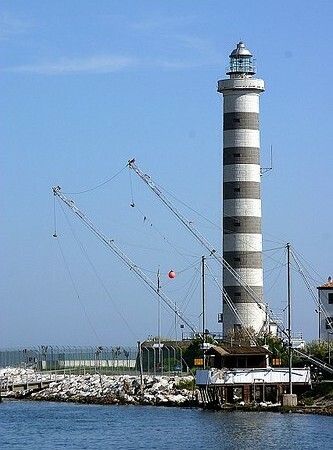 The lighthouse is on the north side of the entrance to the Po della Pila, about 3.5 km (2 mi) east of Pila. Accessible only by boat. Site open, tower closed. ARLHS ITA-129; EF-4084; Admiralty E2440; NGA 11436. Posted August 21, 2006. Checked and revised November 8, 2018. Lighthouses: 30. Site copyright 2018 Russ Rowlett and the University of North Carolina at Chapel Hill.